The tri training has slowed down a bit this week. I tried to get in a few work outs before we go away. Monday I did some weight and strength training, increasing my weights and reps. Tuesday we went bowling with Liz's co-workers from the Opera Company. It wasn't exactly exercise, more like exercise in futility. I bowled a pathetic 66, an all-time low for me. We had a great time nevertheless and it was nice to spend time with her co-workers during a non-work related event. Wednesday was by far my most ambitious day. I woke early and went swimming. After work, I left early and made an attempt to ride my bike to Paoli. After a brief false start, I was on the wrong route out of the city, I found myself hammering along some familiar trails and inclines with greater ease. The new Fuji Road Bike is definitely a faster machine. 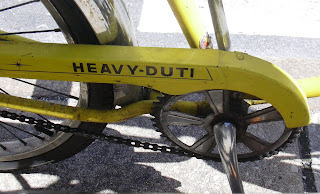 My neighbor, Michele, said that as I decrease in size, so does my bike. The bike and I are able to take on the routes faster without as much effort. Boy! Am I ever glad I bought this new bike. The ride I took was a ramble out to Devon, via a cue sheet from the Bicycle Club of Philadelphia. I've taken the ride home from Devon twice, but much of the ride is downhill, so it's easy. This is the first time I felt strong enough to attempt the ride out there. The cue sheet directions were pretty straight forward, taking me through Wynnewood, City Line, Bryn Mawr, Merion and out to the Main Line. I was doing well enough until I reached Bala Cynwyd, where I got my first flat on the new bike. A good practice lesson in how to change the tires. I wasn't daunted, though I did lose some valuable time. I figured I could make up for it by going a bit faster. Then I hit some steep hills. Climbed them slowly and steadily and I only had to walk up one hill, mostly because I was nervous about where I was. Then came the winding narrow roads with lots of traffic. Managed to navigate these without getting clipped or knocked off the road. Then the next thing I knew, I was lost in the wilds of Rosemont, at least 8 miles away from where I needed to be at 6:30, with less than a half hour to make it to my destination. I rode a bit further. I stopped and asked somone for directions, only to learn that I'm really far from where I need to be. Okay, I regroup and ride through the campus of Rosemont College. I figure out where the train station is. And then it all starts to go very very wrong. I find the train and go up to the platform. At first I'm on the wrong side of the train platform. I run down the steps, carrying my bike, up the other side and onto the platform towards Paoli. The train pulls in within a minute of my getting there. It's now 6:10 and the conductor takes one look at me and the bike and tells me, nope, you can't get on this train with a bike, as it's still rush hour and bikes aren't allowed. I'm an anxious, exhausted, sweaty mess and I can't control the tears streaming down my face. The train pulls out and I'm trying to figure out where I am and how I'm going to get to Paoli in the next 15 minutes. I make a call. I figure out where I am in relation to the distance I need to go. Then I walk back down the train station stairs and head over to Lancaster Avenue which is a block away. When I get there I look up the road and it appears as steep as the Levering Street Wall in Mannayunk. There's no way I'm going up this autobahn on my bike during rush hour and making it in one piece in 10 minutes. I call my therapist, because by this time, the appointment I had, I really really need! We wound up talking on the phone for my session, while I sat on a rock along Lancaster Avenue on the lovely Rosemont College Campus. It was surreal but at the same time kind of grounding. Even though I missed my appointment in person, I was able to reconnect and regroup without any serious damage. I rested, drank some water and ate the peanut butter sandwich and bananas I packed. I Called home and decided that I should take the train home. A good plan, except I just missed the train back to Philadelphia and the next one wasn't for another hour. Here we go again! So back onto the bike I go, through Rosemont, Bryn Mawr and into Ardmore riding down Lancaster Avenue. I get off track and realize that my determination is getting me lost instead of leading me home. Luckily I was near enough to the train tracks the I could get to the Wynnewood Station easily. I wound up taking the same train home that I would have been on had I made it to my appointment, had my therapy session and came home sans bicycle. The moral of my story - being determined to get somewhere by sheer will and force is fine, but you have to have a plan and a back up plan just in case. I realized that I have the ability to carry myself and make it up many hills and overcome whatever obstacles that might be in my way, but I still need to take it slow, stop and ask for help and directions when necessary, and I must, at all times, be aware of my limitations. Wow, I hadn't realized how bad the ride was! A flat, too?! It is great that you were able to overcome and feel good about the experience in the end. Have a great time out west.